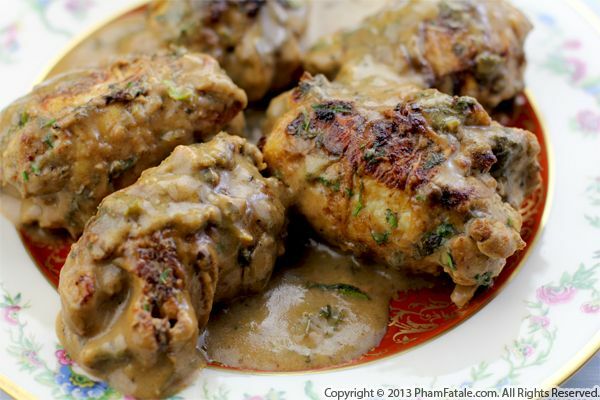 This is my second most favorite chicken recipe (after my poulet rôti, "roasted chicken"). The whole idea is to use dark meat from the chicken thigh, stuff it, pan-sear the meat and finish cooking in the oven. It's as simple as that. First, I used boneless chicken (de-boning the thigh and using the bones for excellent chicken broth) and made sure the skin was still on. Then I proceeded with the tender meat. I used a preserved lemon marinade and let it rest overnight. For the filling, I combined roasted red bell peppers, Manzanilla olives, shallots and cornichons (French gherkins). To me, cooking is an expression of love. The dish doesn't have to be complicated. Learn your basics and you'll be able to dazzle your friends and family with creative, over-the-top dishes by making a few variants of your favorite recipes. I had never heard of or tasted muhammara before until I met the folks at California Lavash. Every time I met with their team, I would hear how exquisite it tasted. In all seriousness, when you hear about a combination of walnuts, charred red bell peppers, fresh pomegranate seeds, lemon juice, garlic, mint, salt and pepper, it’s difficult to imagine how it couldn’t taste amazing! 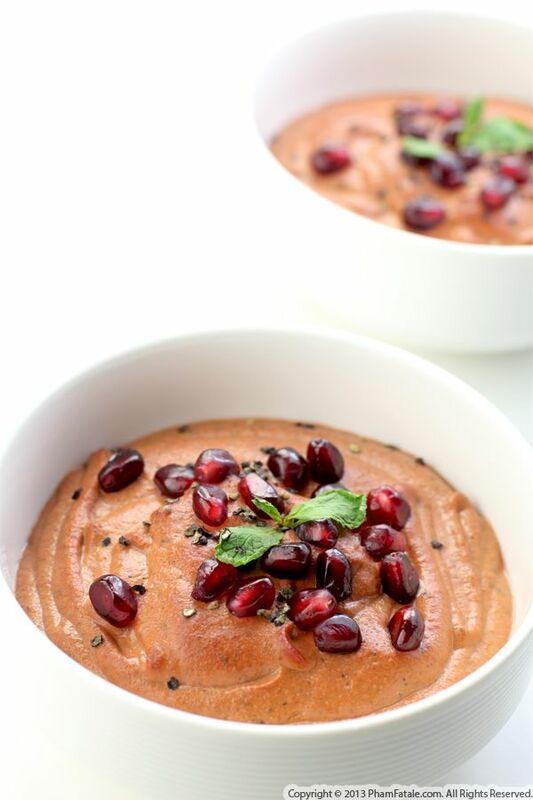 To thicken the texture of the dip, I added bread and extra virgin olive oil, and balanced the flavors with dates, a hint of ground cumin and red chili powder. You could use it as a dip served with toasted pita bread or cucumber and celery sticks but in my case, I used it as a spread for a roasted lamb sandwich. It was delicious! This is a meal that would fit perfectly at your Christmas Eve dinner table. What I love most besides the incredible flavors is the beautiful presentation of the food. 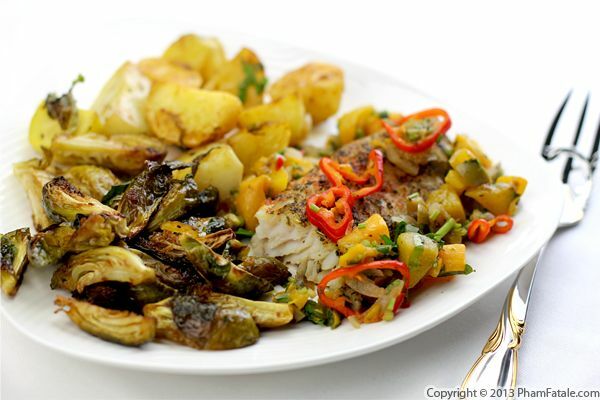 Plating plays a big part in the aesthetics of a dish, so don’t forget that aspect as you plan your holiday feast. I prepared veal escalopes stuffed with lemon, pine nuts, golden raisins, garlic and fresh tarragon. Once the escalopes were cooked, I completed the dish with a flavorful sauce made from the pan drippings. By the way, there is still time to order both of my cookbooks, Haute Potato and Banh Mi, as gifts to your loved ones for Christmas . 2013 was a great year for me professionally, and 2014 seems to be starting with a bang. I;m doing a Golden Globes Luxury Gifting Suite at the beginning of the year and copies of Banh Mi will be included in the celebrity "swag bags." Celebrities will be photographed on the red carpet at the suite with the Banh Mi book and I will be serving a few dishes from my cookbook. I'm so excited! If you're planning on serving poultry on Christmas Eve, you might want to consider this dish. 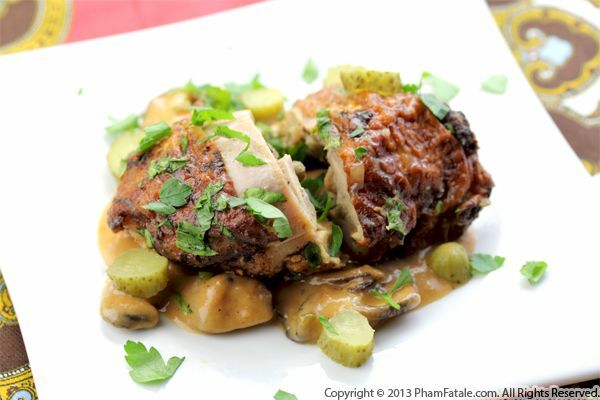 I stuffed chicken with morel mushrooms, caramelized onions and season-friendly roasted chestnuts. I used chicken thighs with the skin on so the meat remained ultra moist and because boning them could be done without difficulty. The whole procedure isn't necessary but it gives the dish an attractive appearance. 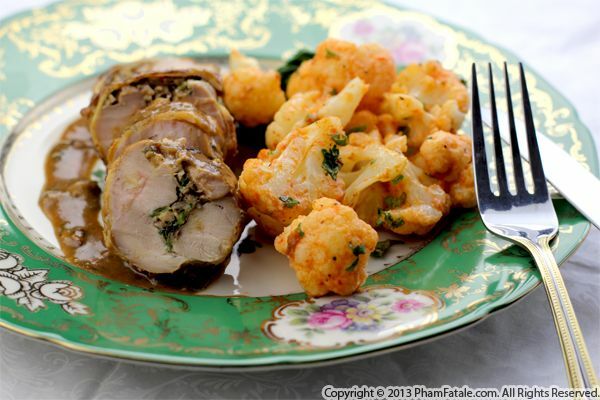 Once the chicken was cooked, I let it rest for 30 minutes and obtained beautiful slices of chicken roulade. I'm definitely going to recreate this dish for Christmas, though I'm not sure which poultry I’m going to use. This recipe could be used with duck, pheasant or turkey, but I prefer goose for a holiday feast. You could also use the stuffing of your choice such as sausage, pesto, sun-dried tomatoes, blue cheese, dried cranberries or bread dressing. I can't predict the future but I can tell this is going to be a delicious holiday season! Page 8 of 8 pages.